There is much concern from both parents and health professionals about sugar intake these days. This concern has sometimes led to parents being cautious about providing baked good for their families. Did you know January is baking month? Well, it is! Let’s celebrate by learning how to reduce sugar when baking. The concern for sugar intake was heightened following the American Heart Association and other professional health organizations recommending that a child’s sugar consumption be limited to 25 grams of added sugar or less per day (6 teaspoons per day). Other health organizations such as the World Health Organization (WHO) recommend that less than 10% of caloric intake come from added sugar, which could be higher than 25 grams per day depending upon caloric needs. For example, a child that requires 2000 calories per day could consume up to 44 grams of added sugar per day according to the WHO recommendations. What is considered an added sugar? An added sugar refers to sugar that is added to food in processing. There are foods that contain natural sugars like fruit, milk, and yogurt. Parents do not need to worry about the amount of sugar that occurs in food naturally. Foods that are large contributors to added sugars in foods are candy, cakes, soda, juice drinks, fruit snacks, sweetened cereal, flavored yogurt, and flavored milk. *Many juices that are 100% fruit juice are made from concentrate and then reconstituted with water and no other forms of sugar are added. However, when fruit juice concentrate is an ingredient without the proper amount of water added then it can be considered a source of added sugar, which is common in foods like fruit snacks and fruit juice cocktails. Some families have decreased their baking frequency due to concern of the sugar content in baked goods. Therefore, I want to provide you with ideas on how to replace or lower the sugar in recipes. Decrease the amount of sugar by ¼ to ½- If a recipe calls for 1 cup sugar then I would recommend adding ½ to ¾ cup of sugar. If I am making something that includes fruit as an ingredient, I will increase the amount of fruit and decrease the added sugar as the natural sugar from the fruit will add sweetness. I have done this in multiple recipes and my family happily eats the finished product. Use date paste- Date paste can be a way to replace sugar with a natural fruit sugar. To make date paste place dates in a bowl and add enough water to just cover the dates. Let the dates sit in water for at least 10 minutes. Then add dates and water to a food processor and blend until it makes a smooth paste. For every 1 cup of sugar add 2/3 to 1 cup of date paste. I have had luck replacing part of the sugar in recipes for chocolate avocado muffins or banana chocolate chip bread. Unsweetened applesauce- Applesauce with no added sugar can replace sugar 1:1, but the liquid ingredients in the recipe may need to be decreased since the applesauce will add extra moisture. Other fruit or vegetable puree- Bananas, pumpkin, and pureed prunes can all be used to replace all or part of a sugar in recipes. Prune and pumpkin puree can be used well in chocolate flavored desserts. You have probably noticed that honey, molasses, and maple syrup are not on this list. The reason for this is because despite the fact that they may be more nutritious than granulated sugar they are still considered added sugar. For more information about decreasing or replacing sugar click here for to receive a free download 40 lower sugar snacks for kids. I hope you can use this information to feel better about baking for your family. 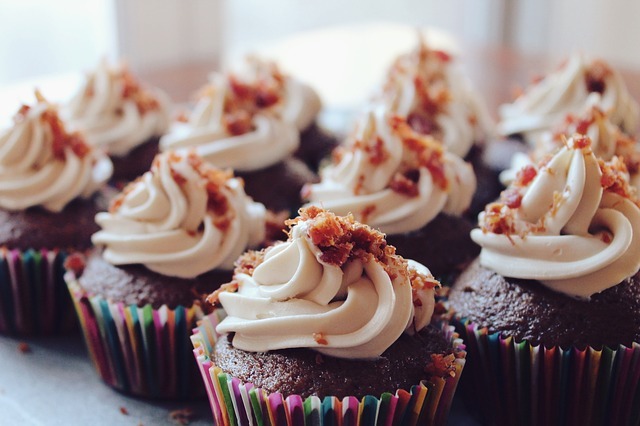 Some think the answer is to not provide baked goods, but research shows that restricting foods like cookies, cakes, and muffins only result in a child desiring them more. So enjoy the month of baking and experiment with these ideas to help get your kids in the kitchen. Family Health Goals for 2019: What has influenced you?